The world knows about tapas now, though less about their Basque cousins, pintxos. In San Sebastian, the fairytale-pretty resort town on the northern coast near the border with France, you find pintxos on offer in every bar, and every bar has its own special pintxos. Fish, meat, fruit, preserved vegetables … an endless variety of combinations with two things in common. They all sit on a base of bread, and are always skewered together with a toothpick ("pintxos" comes from the word for "pierce"). The reason is simple: you graze, casually, from the available selection as you drink, then you count up all your toothpicks to work out how much to pay. At home, I'll often improvise a small tray of pintxos from bits and pieces I have to hand to nibble on with drinks before dinner. 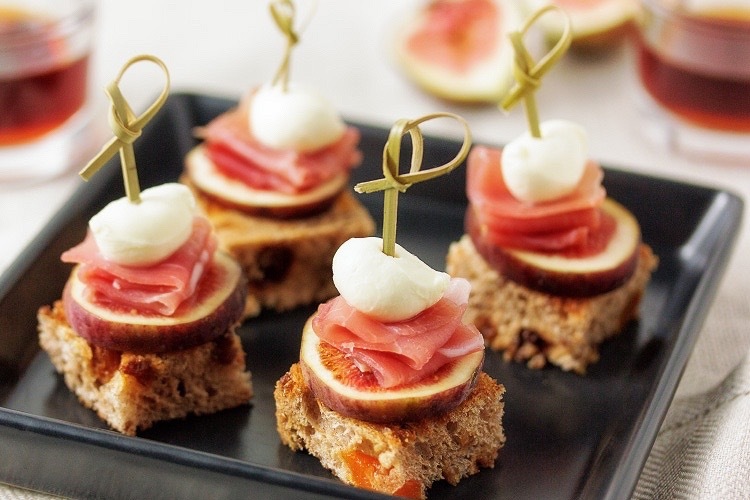 When the first little figs come into seasonal profusion, however, I up my pintxos game, making my own Basque-inspired version with a distinctly Italian spin on a base of fruit-studded bread, with a squiggle of salty prosciutto and grape-sized balls of fresh mozzarella, bambini bocconcini. With a slice of sweet, ripe fig, it's an irresistible combination. You don't really need a recipe for these – although one, such that it is, follows – and you can play and substitute as you like, of course. And we won't even count the toothpicks. Toast the fruit loaf and cut each slice into four squares. Slice the figs across (I get 4 slices out of the small, early-season figs), and place one slice on each square of toasted fruit loaf. Cut the prosciutto in half lengthways, and then in half across. Fold or roll each ribbon of prosciutto up and place on top of the figs. Top with a ball of bocconcini and skewer everything together with a toothpick.